What is Guided Search and How Do I Use It? Guided Search is a feature that allows you to find colleges based on certain personal criteria, including financial aid, academic profile, and social experience. 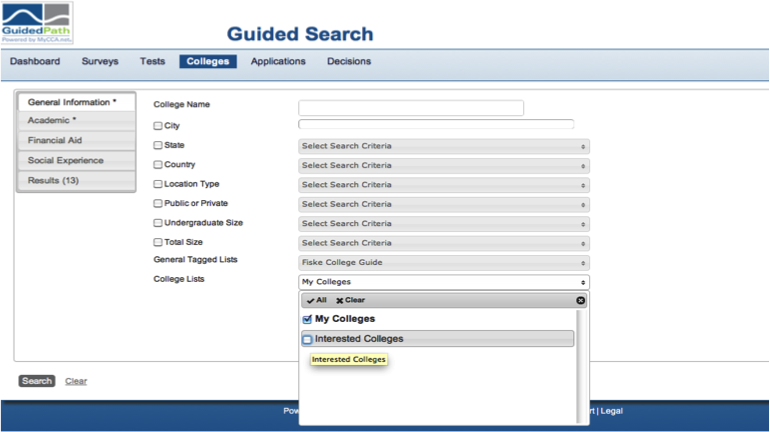 To use Guided Search, select ‘Guided Search’ under the ‘Colleges’ tab. On this page, you can set parameters for any of the given criteria to narrow your search. Simply check the box to the left of the category name, and then choose your restrictions in the pull down menu beside the name. Start with only 2-3 restrictions, and narrow it further from there. If you already have a college in mind, you can access it by typing the name into the ‘College Name’ box at the top of the screen, and then clicking ‘Search’. Once I Find Schools, How Do I Add Them to the ‘My Colleges’ List? There are two ways to add schools to your ‘My Colleges’ or ‘Interested Colleges’ list. If you are absolutely positive you want to add a school to a list, click on the plus sign to the right of the college name. This will place the school on your ‘Interested Colleges’ list. If you are unsure whether you want to add a college to your list, click on the college name. This will take you to the College Details page. If after reading this page you wish to add the school, select either the ‘ Add to My Colleges’ or ‘Add to Interested Colleges’ button on the bottom left. One of the tools that has been most helpful in my college list compilation process is having the ability to compare all of my schools at once. Using this tool, located on the ‘Guided Search’ page under ‘Colleges’, I am able to compare several aspects of each college, including size, average SAT score, Fiske social rating, and the acceptance rate. 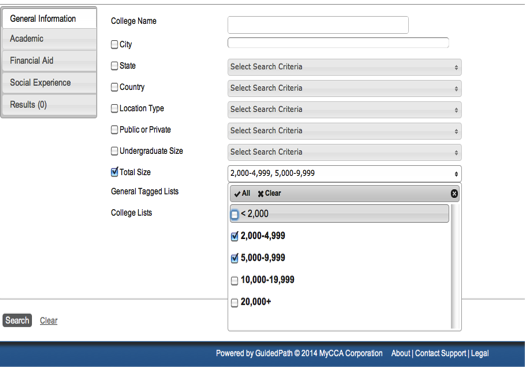 To access this tool, click on the Guided Search button under the Colleges tab. Then, you can select both your ‘My Colleges’ and ‘Interested Colleges’ lists for comparison! Personally, I found it most beneficial to compare the academic criteria for each school, because I was able to rank their comparative difficulty —by clicking on the gray title tab, you can rank your results from low-to-high or high-to-low. You can also drag columns around, allowing you to sort your criteria. 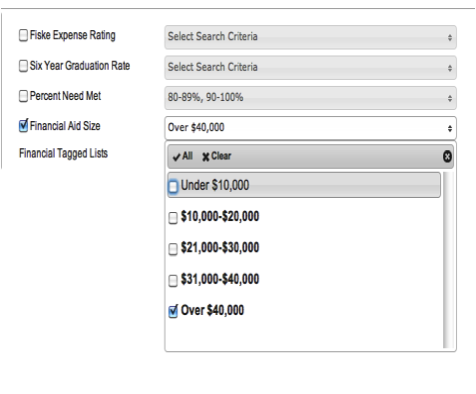 For example, by clicking and dragging on the gray title box, I could drag the SAT score column to the far left. Another helpful element of this tool is its ability to filter out certain criteria. I used this aspect primarily when looking at finances. If I select a financial aid size of over $40,000, I am left with only 8 of my 13 schools. 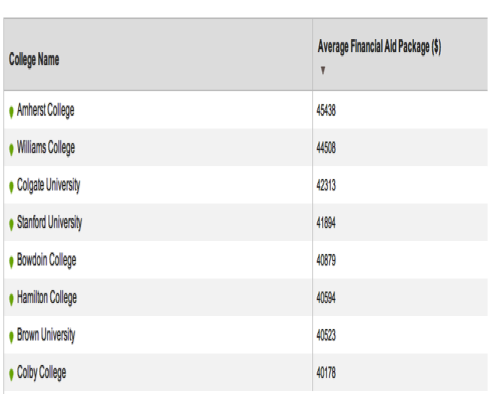 From these remaining 8 schools, I can see which school offers the greatest financial aid package, Amherst in this case. When I use the Guided Search feature, I am getting no results. Why? Most likely, you are selecting too many criteria and therefore filtering out every single school. Try selecting just a few components to start—you can always add more filters if you end up with too many options. When I use the Guided Search feature, I am getting too many results. How do I narrow it down? If you are getting too many results, go back to the selection page, and add more filters. This should filter out additional schools, giving you a more manageable list. To start an entirely new search, click the gray ‘Clear’ button in the lower left hand corner, just to the right of the ‘Search’ button. If you simply want to reselect the parameters in a given category, click on the pull down menu and select the bolded ‘clear’ button at the top of the pull-down menu. Love these tips!!! Thank you.